Look at this humble digital blog about the art of the hand-written letter, all grown up at one-month old. In the past month I’ve mailed ~40 letters and postcards (and I received two). Several folks responded online and let me know my notes were received (and enjoyed) and they filled me in on the happenings in their ‘hoods, chicken coops, and the hallways of their children’s elementary schools. The happy couple celebrated in this 1989 wedding shower invitation just returned from a beach vacation that celebrated 25 years of marriage. This invitation was hand made with TONS of love by the bride’s mother in Kansas and was mailed to my then-roommate and me. (Correspondence received later from that former roommate was featured in my August 6th post.) 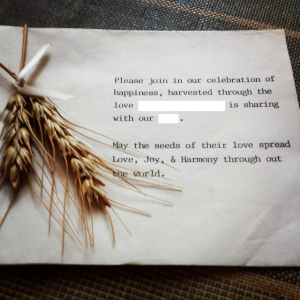 Each invitation was created with paper, a typewriter, wheat, ribbon, and glue (plus TONS of love). Humble and simple by modern standards, this invitation is as beautiful to me today as it was when I received it back in 1989. My roommate and I didn’t have a car, so we piled into a VW bug with a few other friends and carpooled to Wichita for the shower. That was my first time in Wichita, so back then I had a favorable view of the city. In those days, a road trip from Lawrence to Wichita, especially if you didn’t own a car, seemed like an adventure. These days, Wichita is a place I pass through on my way from one place to another, and I only stop if I need to fill the tank and grab Bit-O-Honey or Corn Nuts. 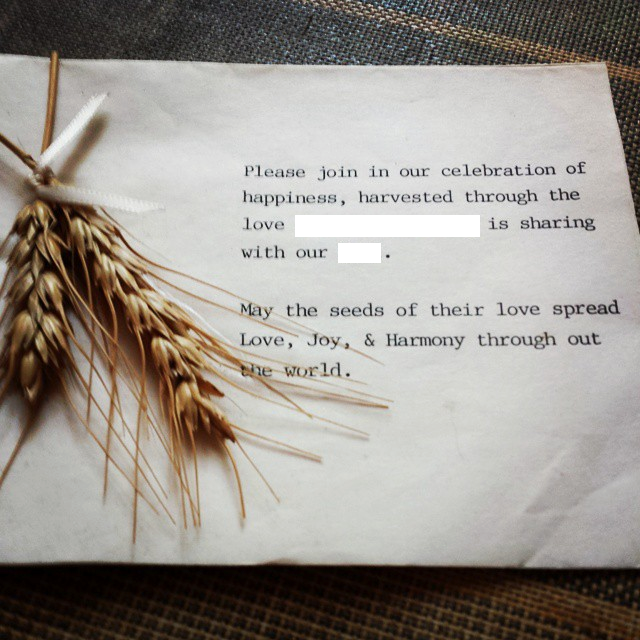 Twenty-five years later, the marriage of the happy couple looks much like this invitation: a few bends around the edges, but otherwise solid, humble, beautiful, and worth the care and attention it takes to endure the elements.